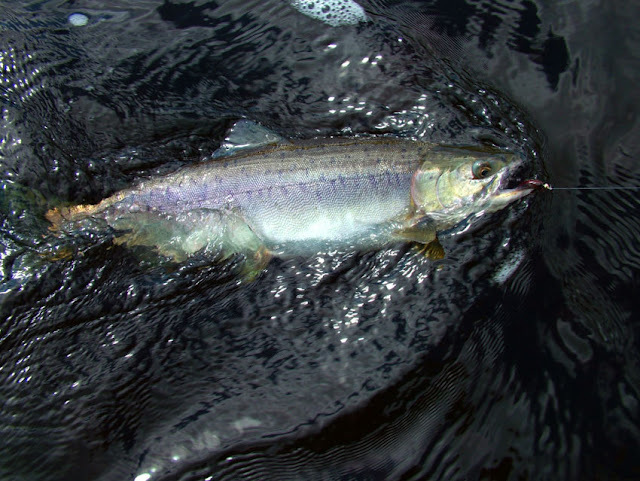 Chavanga Fish Blog: Humpback salmon is our friend! Humpback salmon is our friend! The Atlantic salmon, certainly, has a priority on Kola peninsula. 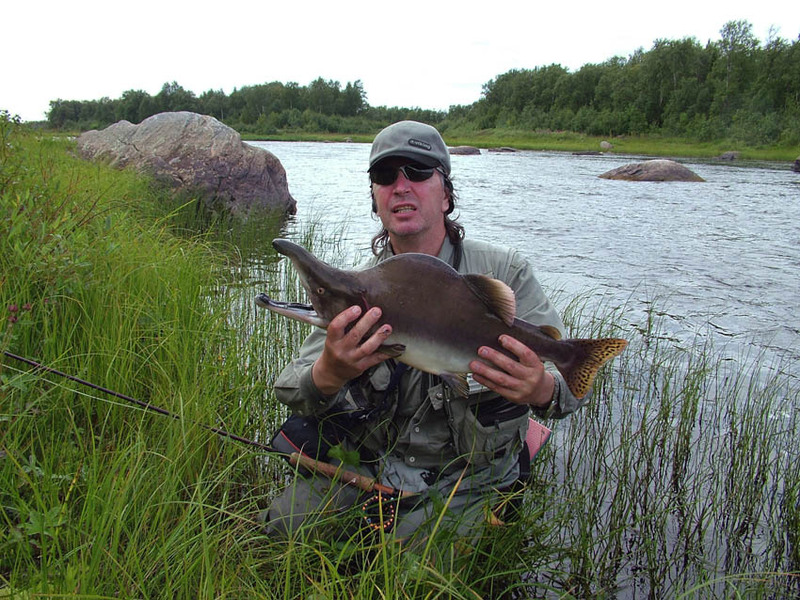 But it is interesting to fish trout, there are fans of grayling. Sea trout fishing in estuary, in a tidal zone became superpopular. For many now it is fishing №1. And the humpback salmon - gorbusha is still pushed on a background. But after all it is the most beautiful fish! In struggle on a hook it simply mad and such sprinters are not present at us more. 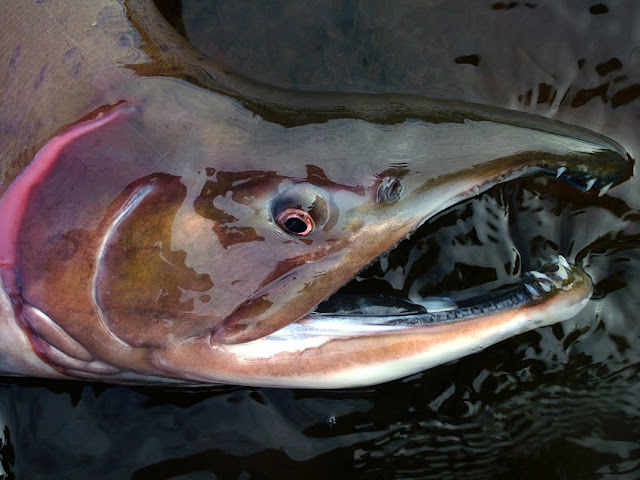 The humpback salmon can break all records on breakages and descents. It is so much damnations from delight in the address any other fish, probably, did not hear. 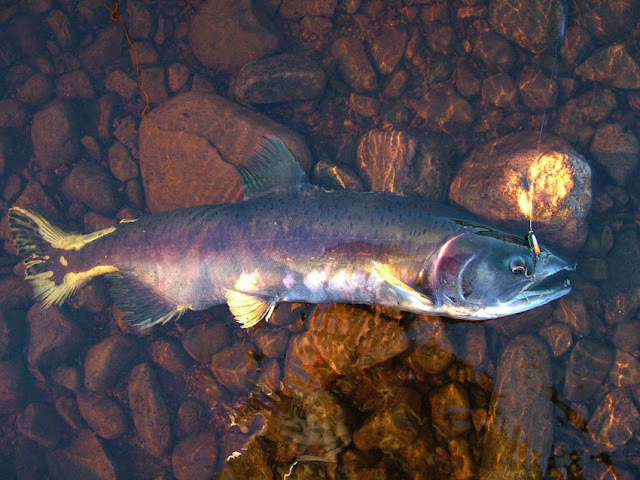 Also has put here not in size, the humpback salmon will not be compared in it to a salmon. Business in extremely sharp temperament concerning it of 1.5-2 kg of weight. Stops us that is difficult to understand principles of its reaction to artificial baits and on flies. Fish is reputed "bad" and the basic tactics of its catching consists in provocation. 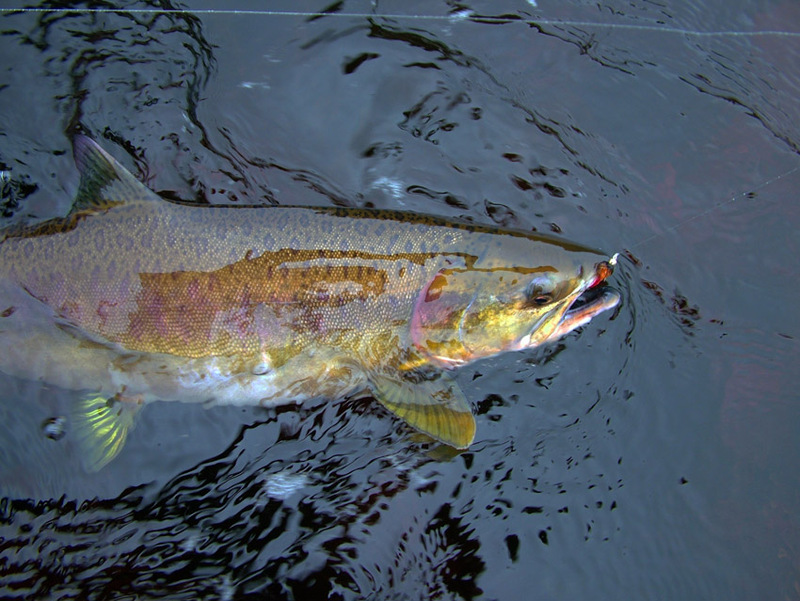 Large enough, bright flies are used, more often it is salmon variants for the big water. 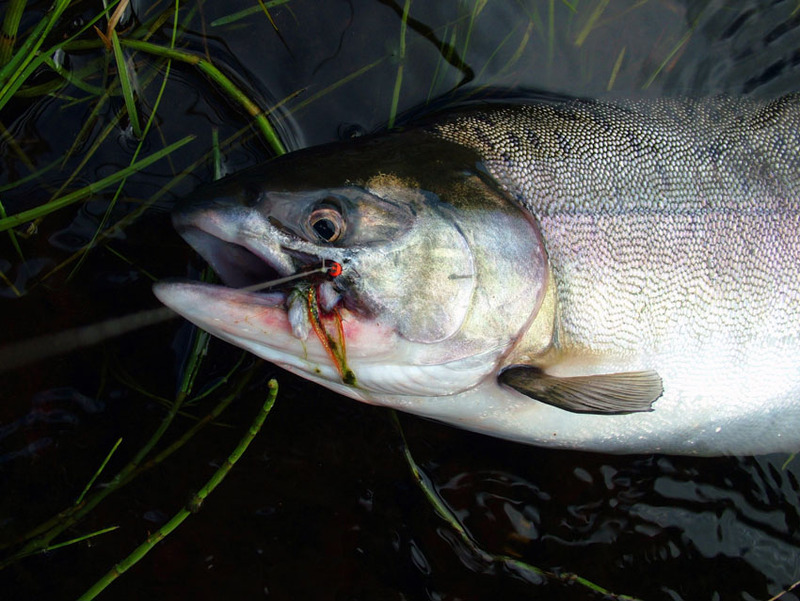 Unfortunately, the humpback salmon ignores often such baits. Happens, you change fly after everyone 3-4 casts, and any fish will not strike on a bait. For the last years I and did not have a certain system in catching a humpback salmon. Perhaps, its metamorphoses in river water passes too quickly, and its each age needs to fish it specially. Certainly, the greatest interest is fishing of the silver fish who have just entered into the river. On my supervision fish actively going upstream reacts to a fly better. Therefore, places for catching it is better to choose the nearest to the sea. In a stream, on small stony rifts fish is aggressive and, happens, all on pleasure, attacks flies without special analysis. But the humpback salmon moves upwards extremely non-uniformly. It starts to stop absolutely near to the sea, in the first rocky clefts and reaches while other big fishes promptly rise on 10-20 km on the river. Thus, from estuary on some kilometres such mix upwards is formed of fresh silver fish and already stood in fresh water. There where there are holes, reaches or other places for long parking, the humpback salmon somehow loses interest to a fly. She still well attacks spinning lures, but it is difficult to fly to discompose it. . Examples of an active biting of silver humpback salmon met to me some times and only on "trout" type flies. 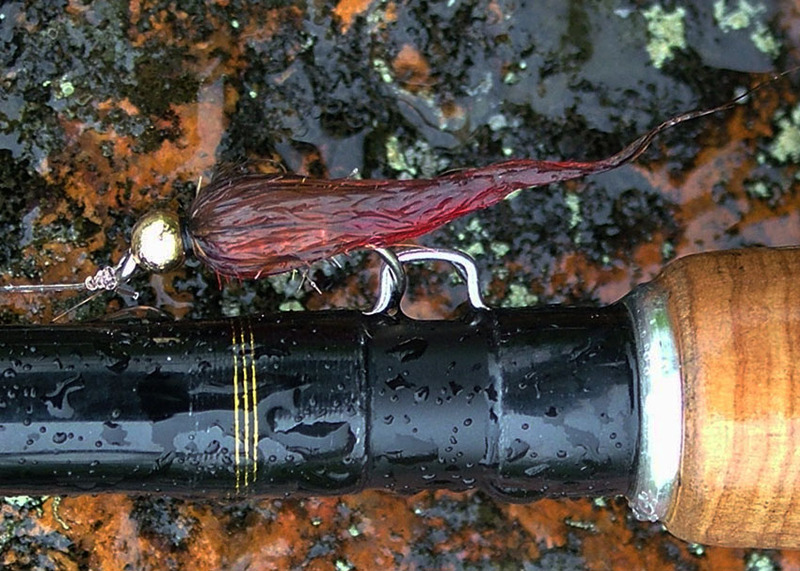 Once I had a wet fly in Red Tag style, prepared on sea trout, with a chenille body on 10 number of a hook. Contrary to references, the humpback salmon this time pecked under the surface. The fly was light , after cast on a diagonal downwards I hardly braked it in a rapid current and at once blow followed. What exactly was pleasant to a humpback salmon, a fly or its behaviour, I do not know. On the other hand it is interesting, what even absolutely fresh, silver fish interest a streamer in exact sense of this term a little. On fry imitation never was stable results though it is represented that sea fish first of all a predator and should wish to eat any trifle. Probably, we are inclined to overestimate aggression of these fishes. I caught on "bloodsucker", a type woolly bugger though, I admit much that again caught with caution on trout. The area of a sea trout and gorbusha coincides often also any conclusions it is possible to make. 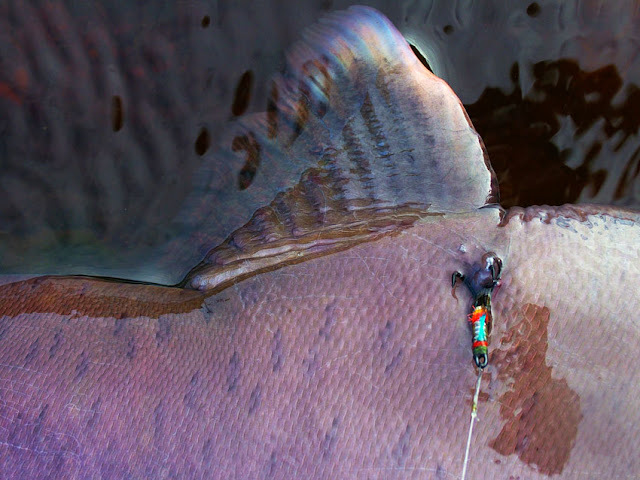 If to touch variants of colouring, the size or bugger weight it is possible to adapt it to sea trout. But here gorbusha attack in most cases all the same looks casual. Change of presentation, fly`s work not strongly influenced efficiency. But nevertheless on reaches or in holes, behind stones attacks happened at continuous pulling up of a fly from depth to a surface is more often. Probably, metal head GHWB simply it is is better adapted structurally for work in such conditions. Last years I somehow depart from standard recommendations in a bait choice at catching of this fish more and more. The usual wet fly is represented to me more often to more effective, than pink - violet marabou. And catching methods in such cases can be the diversified. It has appeared that the humpback salmon not bad reacts to the nymph! I equipped the fantasy nymph with a tungsten head for convenience of catching on the big distances and caught as a usual wet fly. Threw across and downwards, held a little and lowered on a current. Sometimes because of depth I threw hardly upstream, gave to fly a few time for immersing, sometimes braked them in the end of conducting, forcing to stop and rise upwards. Such movements led attacks of fishes who did not give out before the presence. The part of fishes was silver colouring and for certain still went upwards. Other fishes had already lines of the marriage dress. That is fishes with different mood and different intentions came across. On the imitating nymph so I did not catch though if to be beyond their natural conducting, probably, they would get in sight of fish. If someone was interested by fishing on the nymph it is necessary to consider character of nymphs. Hardly it is necessary to try imitating flies. It is not necessary not because hardly will peck, that is why that such flies demand natural presentation in water. More simple methods, type of a "wet" fly fishing and its "aggressive" variants with cast downwards and across cast with a gradual pulling down and deduction are used. Therefore is more practical to use simple numphs. They can be bright enough what to leave number imitating, but on the size and a design correspond to nymphs or wet flies. Anyway the choice of a technique of fishing and the flies size \weight will depend on character of a place of catching. It is possible to remind only the general universal rule - it is recommended to begin with aggressive methods. We put the big bright fly and vigorously we conduct them with every possible strips, mending, provoking attack the most impatient fishes. If the biting calms down or over active fishes is not present at all, gradually we change tactics, we change fly for more modest, we reduce rate of conducting. And so on, depending on result. To fish or to cook? Salmon dishes on the fire. Special mixture- sauna, vodka and salmon.